Othello, in Germany known as Reversi, is an old board game played by two players. It is not as complex as chess or go (especially not for computers), but it is still interesting enough to organize world championships. In Japan where most of the human world champions come from, Othello is a very popular game. 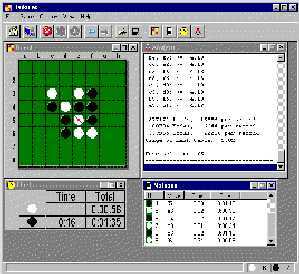 Computer Othello never reached the commercial interest computer chess did. Parallel to the development of the Web and the IOS, the Internet Othello Server, a lot of programs playing Othello have been established. A mile stone in this development was the thesis of Michael Buro, who created Logistello, a program which dominated the scene for many years. As far as I know this system is unfortunately not available on the Web. In the meantime the Othello programs of the upper class are stronger than any human player. Herkules seems to be such a program, which is why I wrote this pages - besides learning my first steps with HTML. In April 2001 version 1.5 of Herkules has been released. It plays even better than previous versions. But most of tuning was done under the surface.